I know I am not the only one that worries about my babies when I am busy doing other things around the house. Jemma is now 3 years old, but she is a busy girl who likes to get into things. She is also the one that I will occasionally find jumping off the toy box. These things really worry me and I find myself avoiding doing some activities because I can’t be sure that she is safe in her room, whether awake or asleep. That has all changed thanks to the Levana Keera 2 Camera Video Monitor. This amazing monitor came into my life recently and the way I function in my home changed significantly. I now know what my girls are doing while in their room or any other room I put a camera! The Levana Keera 2 Camera Video Monitor has some amazing features! I loved how easy it was to set up. Simply insert the battery, plug all the pieces in, and you are ready to go. The screen is so easy to see at 3.5″ and comes with a rechargeable battery, 2GB Micro SD card (with adaptor), and 3 power adapters. That battery I mentioned? It will last up to 24 hours once charged! The monitor gives you the ability to record video and take pictures (something I find truly awesome when “catching” my daughters doing something they shouldn’t be doing). If they move around their room, I can pan, tilt, or zoom the camera to see where I need to see. I can do this with a simple touch of the touch panel button. Once inside the settings, you will find the icons to be large enough to see and simple enough that even the most tired and worn out mom will be able to figure them out. While my girls usually sleep through the night, that isn’t always the case. Jemma especially wakes up sometimes and I worry that I am going to miss her cry. 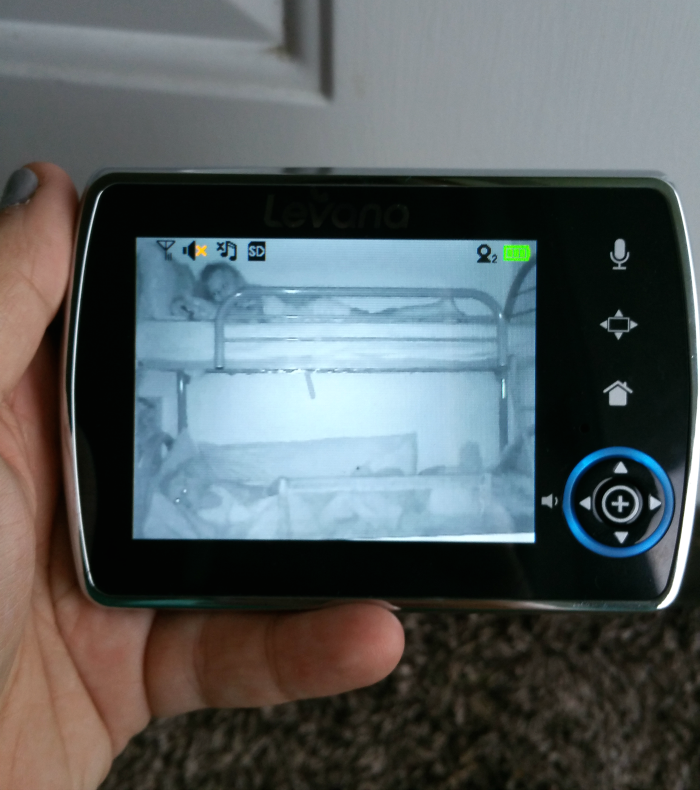 The Levana Keera Baby Video Monitor makes it easy to know that my baby is awake. Adjustable PEEP (Power-on/off Energy Efficient Picture) puts my monitor and camera to “sleep” when there is no sound in the girls’ room. This saves hours of battery life! The second one of the girls makes a “peep”, the camera and monitor will activate allowing me to see and hear what is happening in their room. Oh, and even at night I can see the girls with the invisible LED night vision! Something I would have loved if I had a younger baby is the ability to play lullabies through the monitor. It offers 3 different ones that your little one will be sure to love. You don’t have to go into the room to turn them on either! Just use your monitor to set it up. I really enjoy being able to talk to the girls through the monitor as well. The camera in their room will relay any message I have to Jemma and Joley. This is so helpful when they are awake and goofing off in their room. I have used this feature in our living room as well where I have the video camera pointing to the front outside door. I want to know who is at our house if the doorbell rings whether I am upstairs near the door or not. I can check who is there and tell the kids if they can or can not open the door. This gives me such a sense of peace knowing that they won’t open the door to strangers! Want to see some of my favorite features in action? Here you go! 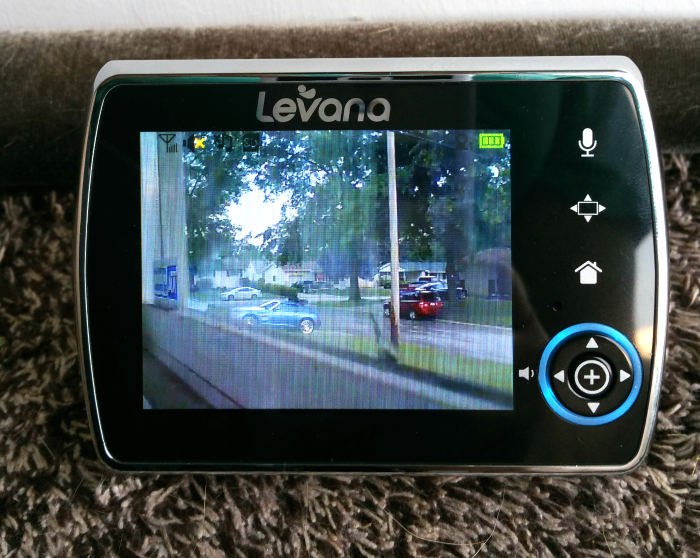 It really is great to have peace of mind and be able to do things I want to do knowing that my kids are safe thanks to the Levana Keera Monitor. Would you like some ideas of things that I now feel safe doing because I can keep an eye and ear on my kids? Check it out! 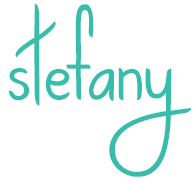 Blog – I can get pretty wrapped up in what I am doing. 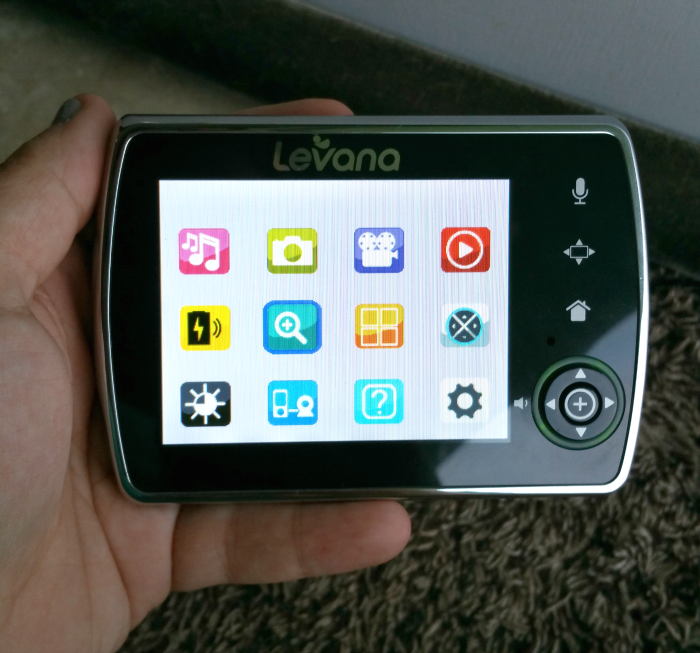 The Levana Keera monitor easily draws my attention where it is needed. Read – I love to read and don’t do it enough because I keep getting up and down to check on the kids. That is no longer an issue. Laundry – Our laundry room is downstairs and I haven’t liked to be down there with the kids upstairs alone. I can now keep an eye on them! Cleaning – Vacuuming and other household chores can now be done without fear that the kids will need me and my not be able to hear them. Gardening – I can now head outside and keep an eye on what is going on inside! Play with my dogs – I can go in the backyard without any difficulties and see and hear what is happening inside my house. Take a bath – Ahhh, every mom’s dream! I can take a bath knowing that my babies are all safe because I can see them. Take a nap – If the girls are sleeping, I can now nap too! I know that the Levana Keera will wake me if they make noise. You can buy the Levana Keera 2 Camera Video Monitor Set for yourself or enter to win one below! Find Levana on Facebook. 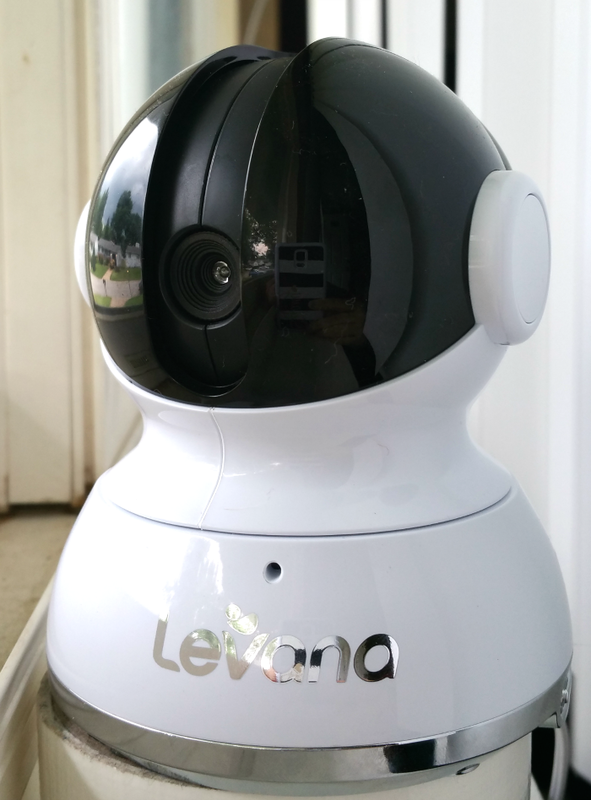 Enter for a chance to win a Levana Keera Video Monitor Set!